2Department of Veterinary Physiology and Biochemistry; College of Veterinary Sciences and Animal Husbandry, Central Agricultural University, Selesih, Aizawl, India. 3Department of Veterinary & Animal Husbandry Extension; College of Veterinary Sciences and Animal Husbandry, Central Agricultural University, Selesih, Aizawl, India. 4Department of Veterinary Public Health & Epidemiology; College of Veterinary Sciences and Animal Husbandry, Central Agricultural University, Selesih, Aizawl, India. 5Department of Veterinary Parasitology; WBUAFS, Kolkata-37, West Bengal, India. 6Department of Veterinary Pharmacology & Toxicology; College of Veterinary Sciences and Animal Husbandry, Central Agricultural University, Selesih, Aizawl, India. 7District Microbiologist, Malda Medical College & Hospital, Malda, West Bengal, India. 8FCLA; College of Veterinary Sciences and Animal Husbandry, Central Agricultural University, Selesih, Aizawl, India. Received 28 December, 2017; Received in revised form 17 January, 2018; Accepted 23 January, 2018. Hypodermosis, Warble fly, Hypoderma bovis, Hypoderma lineatum. Cattle hypodermosis (warble fly infestation, WFI) is an economically important disease in livestock throughout the world. Larvae of Hypoderma spp. cause subcutaneous myiasis of domesticated and wild ruminants. 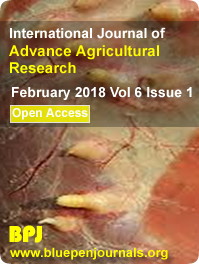 The important species in cattle are Hypoderma bovis and Hypoderma lineatum whereas, Hypoderma diana, Hypoderma actaeon and Hypoderma tarandi, affect roe deer, red deer, and reindeer, respectively. Hypoderma crossi infects sheep and goat. Adults of the cattle grub are commonly known as heel flies, warble flies, bomb flies or gad flies. The larval stages of Hypoderma bovis and Hypoderma lineatum are commonly called ‘ox warbles’. The biology of hypodermosis is complex in nature. The parasitic larval stage of Hypoderma spp. spend about one year in domesticated as well as in the wild animals, while the adult free-living stage lasts only for few days. The disease causes heavy economic losses to animal production like milk and leather industry. It can also affect the general health status as well as the immune system of the body of the diseased animals. The early diagnosis of hypodermosis is of great importance for planning treatment and eradication program. The control measures of the disease have been efficiently practiced and consequently this disease is controlled at national level in many European countries. Keeping in view the importance of the disease, the present review intends to underscore and provide up to date information about the overall aspect of hypodermosis in animals with the existing literature available with special emphasis on hypodermosis on cattle.